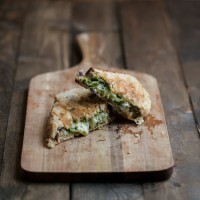 This sandwich was inspired by a pizza that I ate from a wonderful local pizza place in Galesburg, Illinois. I lovev the idea of a pistachios, parsley, and red onions together. 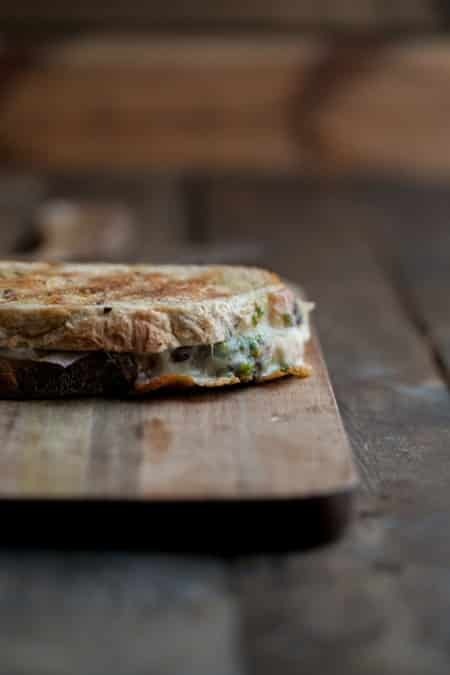 So, this grilled cheese was born with some perfectly melty cheese (I’m leaning towards saying that taleggio cheese may be the perfect one for any grilled cheese). In a food processor, pulse pistachios until resembling course meal. Add garlic and parsley, run processor until minced. Drizzle in lemon juice, olive oil, and salt. Run food processor until pesto comes together, adding more olive/lemon juice as needed. Preheat grill pan or regular pan over medium-low heat. Brush outsides of bread with olive oil. 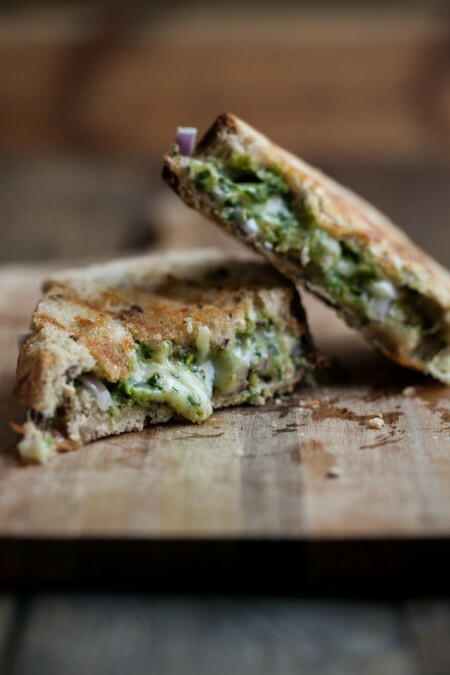 Place on piece of bread, olive oil side down, in the grill pan and smear on 1 tablespoon of pesto. Layer with sliced red onions and cheese. Smear 1 more tablespoon of pesto on remaining piece of bread and place olive oil side up. Cook on each side until crisp and cheese has melted. I’m dying over the thought of pistachio pesto!!! This looks like a killer sandwich. What a great combinaion! You can’t go wrong with good pesto, bread, and cheese together. This is definitely going onto my menu for next week. Squee, I am such a pistachio…well…nut, so I had to come by and have a peek. Saw Aurora Importing share it. So glad they did. It’s simply stunning and looks to be a two fister when I make it. Yay for puns! So glad you stopped by and said hi! oooh yum! Looks like the perfect comfort food. 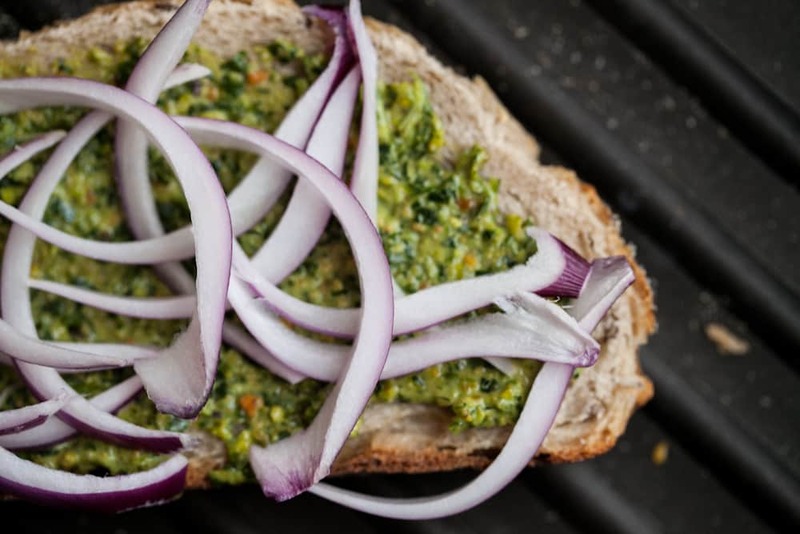 Oh, and that picture with the red onions & pesto on the bread is such a lovely contrast of colors! Yum! This looks so good! I just made a sun-dried tomato Pistachio Pesto and fell head over heels for pistachio pesto! This is a must make! Oh yum! I’ll try that next! This looks so fabulous! Love this idea! I have a boatload of pistachios that have pesto in their future… and maybe I’ll use kale as the green, since I’ve got a boatload of that as well. I think that would be wonderful! Comfort food heaven and sinfully delicious! What an absolutely perfect flavour combination. And those pics? Stunning! did you use salted or unsalted pistachios? Thanks! I did this for lunch today and it was delicious. Thanks for the recipe. Oh, that sounds so amazing! Pinning this to try later. Thanks for sharing this unique recipe! Is it a half cup of parsley or one and a half cups?